The Swamp - Wrens operating the Colossus computer, 1943. Wrens operating the Colossus computer, 1943. Description: Wrens operating the ‘Colossus’ computer, 1943. 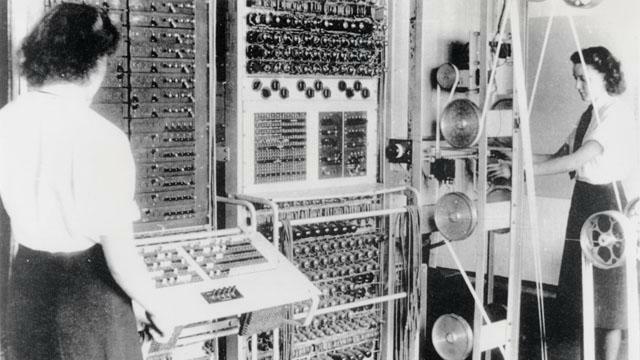 Colossus was the world’s first electronic programmable computer, at Bletchley Park in Bedfordshire. Bletchley Park was the British forces’ intelligence centre during WWII, and is where cryptographers deciphered top-secret military communiques between Hitler and his armed forces. The communiques were encrypted in the Lorenz code which the Germans considered unbreakable, but the codebreakers at Bletchley cracked the code with the help of Colossus, and so aided the Allies’ victory. All images reproduced must have the correct credit line. Clients who do not print a credit, or who print an incorrect credit, are charged a 100% surcharge on top of the relevant reproduction fee. Storage of this image in digital archives is not permitted. For further information contact the Science & Society Picture Library on (+44) 207 942 4400.